Whenever Kit Young spins up his centrifugal fugues of light and sound, the flatness of solely digital sight and sound explode but somehow don't fly apart. Instead his sculptural realia, spectral feedback, and sonic sleight of hand begin to trace stochastic orbits of dangerous possibility. Young's insanely diverse array of color-saturated kinethetic objects, aural timbres, and his menagerie of unhinged collaborators are "dangerous" because once you see what's possible in real space with real people, you're apt to banish all silicon wafers from your fingertips. On this ocassion, simulation by circuit are supplanted by actual hemoglobin-pumping homo sapiens including the great Fred Rinne on DigeriDon't, and you! 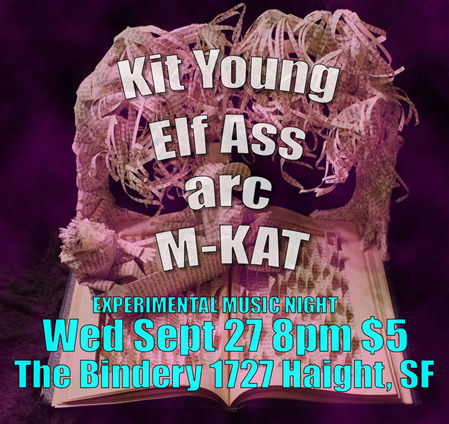 at The Bindery, 8pm WED Sept 27 $5 all agaes ntaflof. Like mixing bleach with ammonia, this combination of Ettrick (drum and sax duo of Jay Korber and Jacob Felix Heule) and Tralphaz (electronics onslaught of David Lim) has always been ill-advised, but when first attempted in 2006 they anticipated the invention of bath salts by nearly a decade. Audiences were said to have lost intelligence, lapsing into silence only to emerge heckling, howling, deliriously happy as they gave up on standing to follow their drool to the floor. Like one big group trust-fall, just don't stand in the back this WED Sept. 27 at The Bindery 8pm, all ages $5 no one turned away. The presence of Tooth is something so elementally all embracing you want to kick free of soil to remain there, or wield some apparatus to perceive his form and substance clearly. But set aside your sphygmomanometers, you're body and symbolic mind have been equipped thru eons of mutation to detect and dwell within Tooth's solo project, arc. All you need do is position the resonant chambers of your physical body and symbolic mind inside The Bindery at 8pm on WED Sept 27. All admitted. Mqrunah, flute, alto master, Kersti Abrams, vibrational bassist Thomas Harrison, thereminist Andrew Joron, and electronicist percussionist Mark Pino convene as the avant-space improv quartet, M-KAT (nee: "Cosmists.") M-KAT unfurls the space-time tapestry stretching from the early 60s avant garde of jazz to wholly original moments of our now and our future. M-KAT will be joined by video improvisor, Ann O'Rourke! Come hear players who hear every edge, listen at every angle and shape every instant beginning with the first moments after 8pm September 27, a Wednesday, in the back room at The Bindery, all ages, $5 no one turned away for lack of funds.